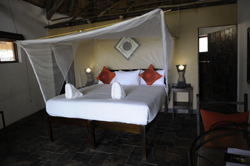 Perfect for any holiday maker, Thamalakane Safari Lodge, promises to meet your every need. Stone and thatch lodging placed in an idyllic setting with spacious interiors and on suite bathrooms you are in for a treat. Most rooms have a gorgeous view of the river so you can enjoy picturesque sun downers from your patio. A dipping pool for those very hot days and great activities to keep you busy when your book gets boring. Only 15 minutes from the airport you can easily take advantage of the flights over the breathtaking Delta. Enjoying shopping at Maun, just 15 minutes drive away and Spectacular bird watching at Lake Ngami an hour away. Thamalakane Safari Lodge also organises day visits to the world famous Moremi Game Reserve. You will be taken on a safari in a 4×4 game viewing truck and soft drinks and meals will be provided. The town has evolutionised in the last decade to a bustling city frequented by tourists. It is a major stopping point and has become an economic metropolis. The city has spread along the banks of the Thamalakane River and boasts one of the best cultural experiences in a major city. Red Lechwe graze along the banks of the river along with donkeys, goats and cattle. Small town vibes still penetrate the city bring along cheery faces and special service. This is a unique place to visits and a must do when in Botswana. For more information on Botswana accommodation and information follow this link.